Do you have a sewing machine just sitting in the closet, maybe even still in the box, because you don’t know how to use it? These lessons are designed for the absolute beginner. You will learn how to operate and control your sewing machine, working through varieties of sewing techniques, basic seams, and construction skill sets help you learn essential construction concepts for beginners. If you talk to any experienced sewist, as they progress in their sewing, the biggest hurdle that presents a major challenge is learning how to make a sewing pattern fit. In this type of lesson, we problem solve your most common fit problems, learning to alter patterns or existing clothes. For those who want to delve further, in future lessons we can build a customized dress form for your body to use in your at home sewing practice. Are you interested in the fashion industry, and want to learn how to make clothing and draft patterns, but don’t necessarily want to go to college full time? Private lessons are a great alternative to full or part time schooling. You'll experience the opportunity to explore design ideas you are passionate about on a flexible schedule. This type of lesson is also an option for clothing entrepreneurs who need in the know support and skills to apply their ideas to actual, wearable designs. Learn how to sew, or to grow your existing skills with more advanced methodologies. My private sewing lessons are available to sewing and clothing enthusiasts who are committed to growing their skill set and want personalized instruction in their unique areas of interest. With private lessons, you work with me one on one, working at your pace and on your schedule towards your unique goals. When you sign up for lessons, I will consult with you to help create a lesson plan for what you want to learn. Scroll below to learn more about the types of lessons I do, and see the types of topics other sewists have tackled in their lessons. 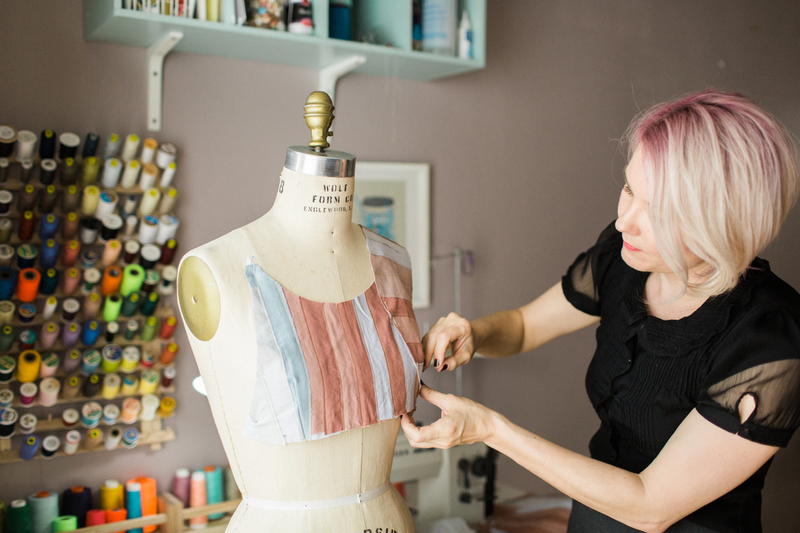 During your one-on-one lessons, you'll work with and receive instruction from an expert in sewn garment construction and receive help with more advanced wardrobe sewing projects like shirts, dresses, skirts, pants, jeans, lingerie, and more! Creating custom plans for intermediate sewists is a specialty of mine, and I have curriculums to help you advance and focus on your process of growth and improvement in your sewing practice. This lesson will teach you an introductory understanding of how sewing patterns work. Are you intimated by sewing patterns and don't know where to begin? In this class, we will discuss commercial patterns and online pdf patterns. I will teach you how to read them, how they fit, some clues into how to make them fit better, and the best cutting practices to apply before you start a sewing project. For students who can't meet with me in person, and want instruction in fit, pattern making, garment construction, fashion design or consulting. We will use Facetime or Google Hangeouts, your choice! These lessons are 30 minutes and are best suited for intermediate or experienced sewists. If you prefer to purchase private lessons in packages, or prefer another payment option to PayPal, please follow this link to register.